VICTORIA, BC - Victoria Highlanders FC (4-8-0) dropped a close match 3-1 versus Cascadia rivals Seattle Sounders U-23 (5-4-3), July 6, at Sunset Chevrolet Stadium in Sumner, Washington. Sounders U-23 took an early 2-0 lead at 25-minutes into the game. A response from Mitchell Popadynetz before half to cut the lead in half was not enough as Sounders U-23’s top goalscorer Santiago Patino scored his second of the night at 79-minutes to seal all three points. Following a massive three point home game vs rivals TSS FC Rovers, the Highlanders traveled to Sumner, Washington looking for a crucial win to push for a potential playoff spot. Winning the first game, the Highlanders hoped for a repeat of their home performance vs Sounders U-23. The game kicked off early with both sides showing their intent to grab three points. Throughout much of the first few minutes Sounder’s top goalscorer Santiago Patino looked most dangerous. The visiting youngster Josh Walter was the most dangerous early on for the visitors, working his way through the midfield. At 21-minutes a build up started from the head of Sounder’s player-coach Philip Lund sent in across the Highlanders box was converted to make it 1-0 from Jamael Cox. Only minutes later Sounder’s top goalscorer Patino put his mark on the board to make it 2-0 from the penalty spot. At 32-minutes a cross from Cam Hundal into Mitchell Popadynetz was converted with a lovely volley back across to the far post to cut the lead in half. The goal gave the Highlanders all of the momentum ahead of halftime. The Highlanders entered halftime down a goal. The Highlanders kicked off the second half with much of the same momentum that they ended the first half with. Despite the pressure, the home side continued to look dangerous. At 53-minutes Sounders U-23’s Hayden Criollo found some space but sent the ball over the net. At 67-minutes Sounders found a way through just to be stopped once again by Victoria’s ‘keeper Ty Venhola. At 79-minutes Patino found a way past the Highlander’s backline to double the lead once again. Patino’s goal was his eighth of the season. Despite a final push from the Highlanders, a strong Sounders side was too much on the day. Victoria travels to Salem, Oregon this Wednesday to face Portland Timbers U-23. 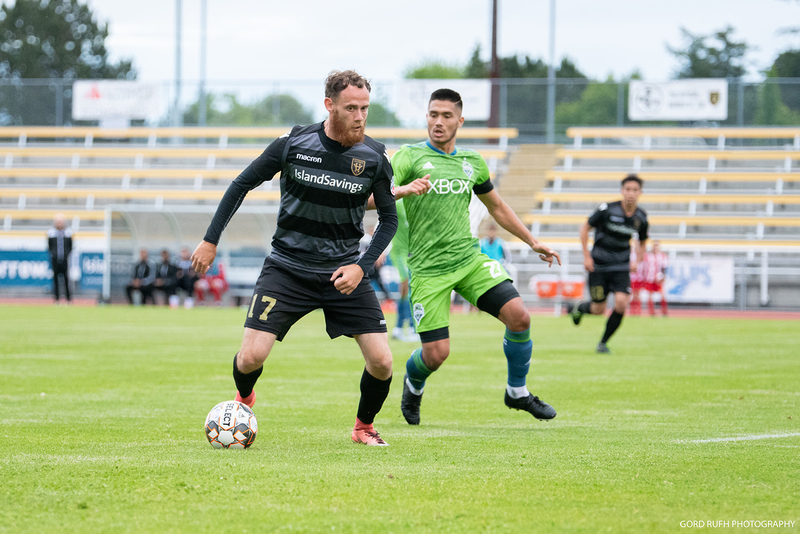 The Highlanders return to Centennial Stadium for their last game of the PDL regular season Saturday, July 14 to face Oregon side, Lane United FC. Kick-off is set for 2:00 p.m. PST. For more information, please visit www.highlandersfc.ca.